Official description from Indiana Code 1-2-2-1: Its dimensions shall be three (3) feet fly by two (2) feet hoist; or five (5) feet fly by three (3) feet hoist; or any size proportionate to either of those dimensions. The field of the flag shall be blue with nineteen (19) stars and a flaming torch in gold or buff. Thirteen (13) stars shall be arranged in an outer circle, representing the original thirteen (13) states; five (5) stars shall be arranged in a half circle below the torch and inside the outer circle of stars, representing the states admitted prior to Indiana; and the nineteenth star, appreciably larger than the others and representing Indiana shall be placed above the flame of the torch. 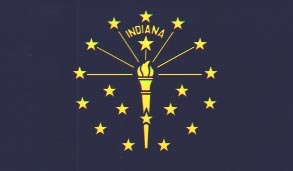 The outer circle of stars shall be so arranged that one (1) star shall appear directly in the middle at the top of the circle, and the word "Indiana" shall be placed in a half circle over and above the star representing Indiana and midway between it and the star in the center above it. Rays shall be shown radiating from the torch to the three (3) stars on each side of the star in the upper center of the circle. Official description from Indiana Code 1-2-4-1: A perfect circle, two and five eighths (2 5/8) inches in diameter, enclosed by a plain line. Another circle within the first, two and three eighths (2 3/8) inches in a diameter enclosed by a beaded line, leaving a margin of one quarter (1/4) of an inch. 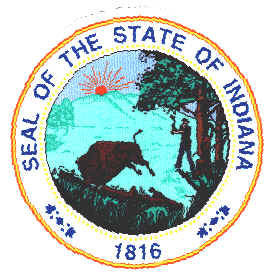 In the top half of this margin are the words "Seal of the State of Indiana". At the bottom center, 1816, flanked on either side by a diamond, with two (2) dots and a leaf of the tulip tree (liriodendron tulipifera), at both ends of the diamond. The inner circle has two (2) trees in the left background, three (3) hills in the center background with nearly a full sun setting behind and between the first and second hill from the left. There are fourteen (14) rays from the sun, starting with two (2) short ones on the left, the third being longer and then alternating, short and long. There are two (2) sycamore trees on the right, the larger one being nearer the center and having a notch cut nearly half way through, from the left side, a short distance above the ground. The woodsman is wearing a hat and holding his ax nearly perpendicular on his right. The ax blade is turned away from him and is even with his hat. The buffalo is in the foreground, facing to the left of front. His tail is up, front feet on the ground with back feet in the air - as he jumps over a log. The ground has shoots of blue grass, in the area of the buffalo and woodsman.